Protest rallies were staged against Geo News Network after the channel allegedly showed blasphemous content in its morning show “Utho Jago Pakistan”, hosted by Dr Shaista Lodhi. Protests erupted in various cities, including Karachi, Faisalabad and Multan by activists of religious organisations who chanted slogans and flashed banners and placards inscribed with slogans against the television channel. According to reports, protests in Faisalabad were held by workers of Majlis-e-Wahdatul Muslimeen (MWM) and Sunni Ittehad Council (SIC). The MWM also held a protest rally in Islamabad. In Karachi, the Ahle-Sunnat Wal Jamaat (ASWJ) held a protest at Nagan Chowrangi and the Imamia Student Organization (ISO) at Numaish Chowrangi, whereas the Jaffaria Alliance Pakistan also held a large protest in the city. 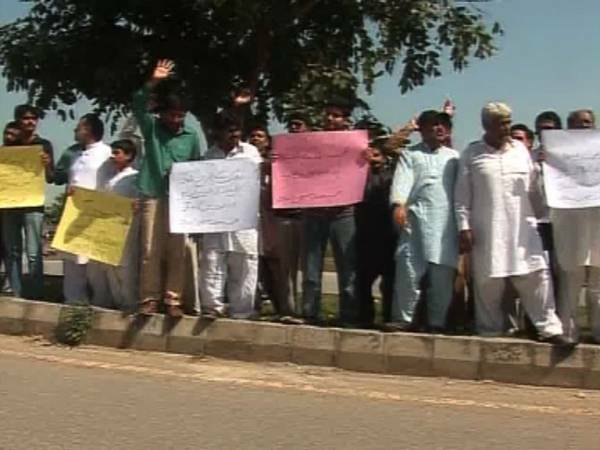 Several protests were also reported from different parts of Peshawar on Friday. The protesters demanded that the transmission of the channel be shut down and a case be filed against the channel administration as it had hurt the sentiments of Muslims. Condemnations had flooded in from all religious schools of thought against the private channel soon after the programme was aired. Various religious scholars had described the show as ‘blasphemous’, and had called for a ban on Geo’s transmission. Later, the SIC had issued a fatwa (religious edict) declaring watching Geo TV as ‘haram’. It had also demanded that the government ban the Jang/Geo Group satellite channels just like it banned YouTube. Angry slogans were also hurled at the show’s host Shaista Lodhi, who recently issued a brief apology over the incident. Shaista expressed remorse over the incident and tendered an apology on behalf of her team for the circumstances that were triggered unintentionally due to the content of the programme broadcast on Wednesday. Lodhi said that she has sought forgiveness from Allah over the unintended gaffe that hurt the people’s sentiments. rior Baleeghur Rehman then said that NADRA had lost the record of the application. The statement further said that when Prime Minister Nawaz Sharif was contacted over the issue, he directed Nisar to resolve the matter immediately but Nisar came up with another excuse saying that Hussin’s picture in NADRA’s record was ‘improper’. “Thousands of supporters of Hussain are agitated over the response of the interior minister and if the NICOP is not immediately issued to the MQM chairman, people will be forced to stage country-wide protests,” it said. The party again demanded of President Mamnoon Hussain and PM Sharif to take notice of the situation. MQM WALKS OUT OF NA: Meanwhile, MQM MNAs staged a walk out from the National Assembly on Friday to protest against the non-issuance of NICOP and passport to its party chairman. Speaking in the House, MQM’s Asif Hasnain alleged that the government was adopting an undemocratic attitude by resorting to unfair tactics. He said the state minister for interior had claimed that Hussain’s data had been lost, while in fact, a NADRA team had visited Hussain’s residence and collected the data. “If Maryam Nawaz can be issued a passport, why not Altaf?” questioned Rashid Godil. On this occasion, State Minister Abid Sher Ali said it was not appropriate to name Maryam in this issue, adding that Hussian had himself surrendered his passport to British authorities, and would now have to adopt the legal way to get Pakistani documents. ALTAF ALLEGES NISAR LYING OVER NICOP: MQM Chairman Altaf Hussain said that it was his fundamental right, as a Pakistani national, to get the NICOP and passport. In a statement issued from London, Hussain said that he had been waiting for his identity card and passport for over one month, as the government is wittingly using delaying tactics including fingerprints and photographs. Lashing out at the interior minister, Hussain said it was regrettable that the federal minister was lying over the issue, adding the minister should have informed him earlier, if the photograph was not up to the mark. Commenting on the latest fray in the episode, Hussain said the federal government was making a fuss over the NADRA crew visiting his residence and taking his fingerprints and photographs. Hussain also gave example of PM Nawaz Sharif’s daughter Maryam, who had sought to change her name in the identity card. He alleged that a NADRA team raced to her house to complete the procedure and she got the new identity card the very next day. Hussain complained that it was political victimisation on part of the federal government which is unwilling to issue him his new NICOP, adding that the action has offended millions of his well-wishers. Please put a ban on ALL such stupid morning shows on all tv channels…all channels are guilty of this blasphemy. Past videos of such content aired on channels like ARY and Samaa are being floated around on facebook. Ban them too, and act justly. Geo at this time is only being targeted in isolation because of its earlier stupid decisions against the ISI. Also, definitely stop Shaista Wahidi from ever coming on tv since in addition to herself, she inspired a whole new generation of intellectually illiterate, morally/culturally degraded and highly superficial woman who essentially preach superficiality everyday on tv. STOP THEM ALL!